Measurement Computing's WEB-TEMP is a Web-enabled temperature measurement device that provides 8 temperature inputs and supports all of the common sensors types — thermocouples, RTDs, thermistors and semiconductor temperature sensors. The WEB-TEMP has its own built-in Web server, which allows the user to monitor the temperature on a browser from anywhere in the world, via the internet. 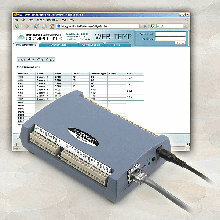 The WEB-TEMP provides temperature measurement flexibility as each channel can monitor any of the supported input types. This allows you to mix and match the sensor to measurement without needing additional signal conditioning. The WEB-TEMP offers the most accurate temperature measurement possible, since the internal measurement electronics accuracy exceeds the accuracy specifications of the temperature sensors. In other words, the WEB-TEMP will provide the best measurement your sensor is capable of. The combination of the WEB-TEMP and Measurement Computing’s DAQ software suite gives you a complete data acquisition solution that will have you taking measurements in minutes.